Unabashed bibliophiles, English literature buffs and lovers of Elizabethan tragicomedy unhurried in their campus meanderings should make a beeline for the Bancroft Library, where they’ll discover a display of rare printed works by William Shakespeare. The mini-exhibit features four bound editions of collected Shakespeare plays printed in folio format during the 17th century. No more than 20 libraries across the United States possess a complete collection of all four editions. 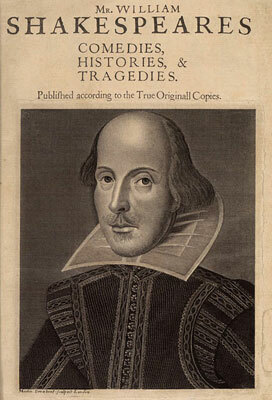 Printed seven years after the playwright’s death, the 1623 first folio, Mr. William Shakespeare’s Comedies, Histories, & Tragedies, which features first editions of 20 of the Bard’s plays, is considered one of the essential signature elements and the crowning glory of any English literature collection. “Collections like this have real intellectual and eye appeal, and every once in a while, we need reminding of Shakespeare’s influence on English language and literature,” Bliss says. Printed in 1663-64, the third folio, which is noteworthy for introducing Pericles to the canon of Shakespeare’s works, is considered the rarest of the four collected editions as an unknown number of unsold copies were destroyed during the great fire of London in 1666. The warehoused volumes were lost following the publisher’s ill-fated attempt to safeguard the volumes by moving them to nearby Saint Paul’s Cathedral. The lead roof atop the famous building’s sturdy stone structure melted during the fire, which engulfed the city. Alongside the four large folios of collected works is a first-edition quarto-format printing of Shakespeare’s The Two Noble Kinsmen. These low-cost, pamphlet-style printings of plays were quickly produced for sale on the street. “There’s a certain kind of theater in what I do here at Bancroft because I want our students to come away with a sense of wonder at the materials and collections they have access to here at Berkeley,” Bliss says. “The Classic 17th Century Folio Editions of Shakespeare’s Works” collection will remain on display in Bancroft’s third-floor reading room through the end of March, and may be extended through mid-April. For reading room opening hours, visit the Bancroft Library website.